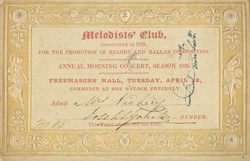 This ticket admits the bearer to an evening of musical entertainment at the Freemason's Hall in London. The term 'free mason' dates from 14th century England, when it was used designate a class of highly skilled stone-workers. The prefix 'free' carried a meaning similar to that of 'freelance' - these craftsmen had no fixed employer, moving from place to place and from job to job. Most notoriously, they had a system of secret signs and passwords by which they could recognise each other. In the early 17th century, individual societies of Freemasons began to admit honorary members, unconnected with the building trade, but with eminent architectural or antiquarian leanings. These people were known as 'accepted masons' (although the term Freemason was often loosely applied to them). These accepted masons were shown the secret signs and instructed in a legendary history of the craft of masonry. The distinction of being an accepted mason became a fashionable object of ambition, and by the end of the 17th century, the Freemasons' main public functions were were social and convivial. This trend only continued and deepened in the 19th century. Reports of their meetings now appeared in national newspapers, and they held many processions, balls and clubs like the one advertised here.